Learn the truth about Hansel, Gretel, and the witch in the bonus chapter. Find cool morphing collectible figures. Discover hidden flowers in every scene. 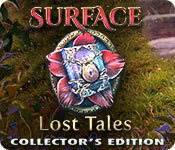 Surface: Lost Tales Collector's Edition is rated 3.9 out of 5 by 48. Rated 2 out of 5 by gamefish500 from An "almost" game. So much of the game could have been good. Sometimes it almost was, but it wasn't. I purchased before playing the demo, my bad. I like the Surface series, so went by that. Never again. The game makes no sense, the princesses you "think" are in the game aren't, it seemed very short and the bonus chapter is stupid. It felt like the developers just threw something together to meet a deadline. Either it was a game they had been working on and set aside or was just not well though out. Rated 2 out of 5 by emeraldorchid from This is awful This was a game I bought without the demo, as the reviews (good and bad) seemed acceptable to me. I got it on sale as a 2 for one, and will chalk it up to a bad choice. Generally I like fantasy/fable story lines, but this just didn't work. In fact it was "uncomfortable" to play. The scenes seemed disjointed, goal paths unclear. And I never liked the Alice in wonderland story, and loathed the cheshire cat, so sorry i "bought" this game. Better to play the demos, even taking in reviews. Rated 2 out of 5 by steve_san from "Lost Tales" Lives Up To Its Name I usually begin my reviews with a brief summary of the story's setting. This time I'll just use a one word description: Fairyland. This is because shortly after beginning play, my brain decided to switch off my "story receptors." That was a not-so-subtle clue that this game was not for me. However, I did continue to play until the end of the trial. The artwork is very good and looks great in both the "real world" and Fairyland locations. 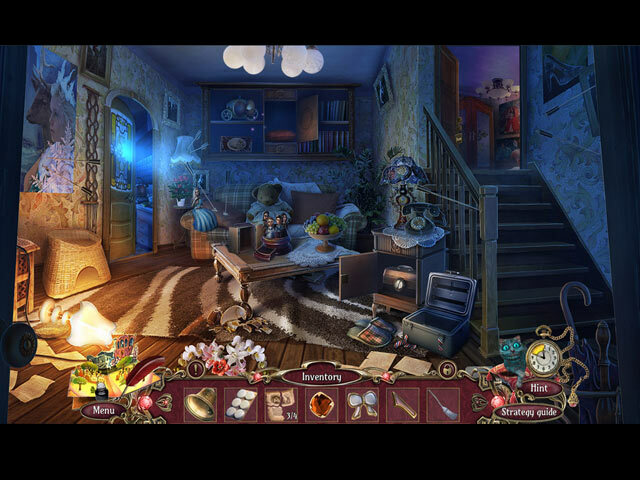 The hidden object scenes are fairy tale easy, but the mini games have slightly more challenge and are integrated well into the game. There are collectible flowers and 12 figures. Can't tell how many puzzles and HOs there are because the developers have the number locked down until the game is completed (bad move). Apparently there is the option to replay them though. Whether this game will appeal to you or not probably depends on how much you like (or should that be love?) fairy tales. This player found the game extremely annoying, and the actions of the main character were sometimes dumbfounding. For example, if there is someone in the next room who is trying to kill you, what would you do? Try to get out of the house? Nah! Call for help with the phone on the desk? Nope! 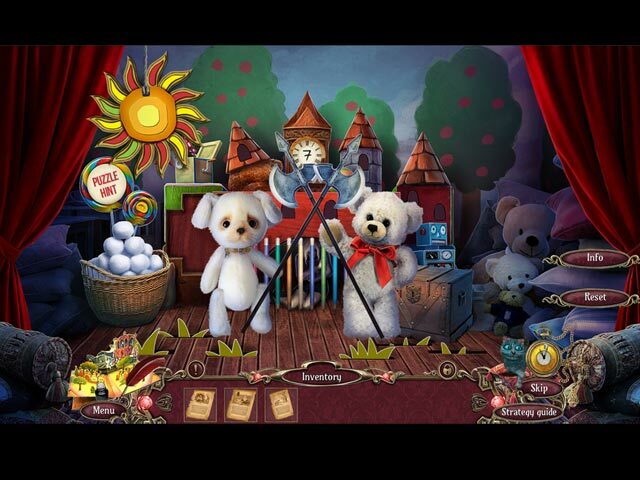 Play a game? Yes! Made perfect sense to me. Give the trial a try and see if the slipper fits. If you can swallow this Cinderella pumpkin of a story, you have a good chance of making it back from the ball by midnight and enjoying your time in Fairyland. Meanwhile, does anyone know how to turn your story receptors back on again? Rated 2 out of 5 by LunaNik from This Tale should have remained Lost. Surface: Lost Tales CE Review based on completed demo PROLOGUE... From its inception, Surface was a groundbreaking casual game series. Its premise was appearances are deceptive, and sometimes reality goes deeper than what you see on the surface. In “Mystery of Another World,” a parallel universe was under the surface. In “The Noise She Couldn’t Make,” a young woman’s personality had fractured, creating a villainous creature bent upon her destruction. In “The Soaring City,” a genius inventor learned that his good intentions did not always translate into the greater good. And in “The Pantheon,” a terrifying alien conspiracy relating to missing persons was uncovered. The story lines behind the first four installments in the Surface series were well-written and developed. Sadly, with the fifth installment, the series went downhill and has remained there, presenting derivative story lines and repetitive gameplay. The “movies intertwining with real life” scenario of “Reel Life” has been done multiple times, including by Sir Terry Pratchett in his Discworld series, and anthologized in Terri Windling’s Bordertown series. “Game of Gods” was clearly a Jumanji rip-off. The “all the adults have disappeared” theme of “Alone in the Mist” has been explored many times, including William Golding’s “Lord of the Flies” and Cloud 9’s television series “The Tribe.” And immersion in “Return to Another World” was impossible given the consistent irrationality of its game design. ONCE UPON A TIME... Here we have another derivative story line…and a confusing, tangled mess. Take every fairy tale you can think of and toss them in a blender, then press purée. Cross that with a woman in our modern world who, for no apparent reason, suddenly discovers that she’s really Cinderella, and part of the “Council of Princesses” which is in charge of Fairyland while the Princes are out battling the evil threatening its borders. To add to the confusion, her cat IRL turns out to be the Cheshire Cat from Wonderland. Really, Elephant…just tromp all over my childhood with combat boots, why don’t you? PLAY THE GAME... As is typical for Elephant games, you’ll be finding a gazillion medallions, amulets, tokens, and bas reliefs to fit into matching indentations to unlock doors, boxes, chests, and caches. Otherwise, things you need are either broken, incomplete, or in the hands of a fairyland denizen who refuses to hand it over unless you trade. HO scenes include mildly interactive list, silhouette, sequential silhouette, pairs, unlock panels to reveal lists, and return items to the scene. None are challenging. Puzzles include: • using left/right arrows to navigate your car around obstacles, • using left/right, up/down, big/small controls to assemble a puzzle, • swap monster tokens to their country of origin, • swap figurines to match diagnoses, • repair a net by choosing the correct three portions of each symbol presented (of the ten shown), • get Cinderella to the ball by interacting with the scene, • jump tokens over each other until only one remains, • move a key through a maze of glass tubing using magnets. SIGHTSEEING... I still miss the live actors. Backgrounds have a handpainted look, and there’s lots of forced perspective. In places, the graphics have a cut-and-pasted appearance to them because shadows are lacking. This isn’t Elephant’s best work. SOUNDBOARD... The music is lovely, appropriate to the theme. Voiceovers are ok, although the grunting of the Huntsman got on my nerves after awhile. Environmental sounds were decent. TOOLBOX... Inventory locks open and there are plus items. The jump map indicates active areas. No animal helpers, thankfully. OH BOTHER! No technical difficulties with Mac OS 10.11.3. OOH! PIECE OF CANDY... Bonus game that doesn’t relate to the main story, SG, morphing objects, collectible Surface flowers, performance achievements, and the developer’s portfolio. EPILOGUE... Once again, I recommend buying the first four and not bothering with the rest of this series. I still replay Mystery of Another World, The Noise She Couldn’t Make, The Soaring City, and Pantheon. Happy gaming! Rated 2 out of 5 by chezmah from Lost Tales...A Real LOSER Only played the VERY short Demo... and barely had the patience to make it through that. Story line absurd... Voice overs terribly annoying Graphics less than average Skipped most of the games from lack of interest HOGs were not fun and the most of the shapes were barely recognizable. Aside from that....well i'm being chased by someone who seems to want to kill me. While trying to escape from him i have to fix the consierge's snowglobe (makes no sense) and then, I when I finally get into my house I go back out into the street because the consierge left me a note asking me to fix the street clock... ???? totally absurd back and forth from the safety of my home to the street where a killer is out to get me !!!!. Then there are the interruptions of low quality of cutscenes that totally take away from the flow of the action..... I definately did not feel engaged by this game and would not even buy it in the SE version. The three previous reviewers gave it 5 stars... but then again their ratings are always published almost simultaneously with the release of the game. Most other reviews have a 48 - 72 hour validation period before their reviews appear...... i wonder why !!! These particular reviewers also seem to give just about all games a high rating. Well maybe our tastes differ (obviously) but i really can't fathom giving this game 5 stars, let alone four or even a three. Some may love ithis game....but i did not even slightly like it. Rated 2 out of 5 by bfeinstein from Some good puzzles and presentation undermined by an incerdibly incoherent plotline Elephant Games is back with another edition of its Surface series. This is a series that was very strong back in the day, with compelling storylines and innovative gameplay, but this edition appears to have lost its way. Welcome to Fairyland, a place where a bunch of familiar fairy tale characters are mashed together in a story line that will serve only to make you pine for the originals. You're Cinderella, although in the 60 minutes of the game I played (I saw nothing that would cause me to drop the money on the full version), I don't know that it was all that meaningful who you were because this isn't a retelling of the Cinderella story. You will stumble across gnomes, the Cheshire Cat, a huntsman who looks like someone out of Sons of Anarchy rather than Snow White, and a sprinkling of other characters seen originally in Disney movies with much better plotlines. This is a very different world than most Surface games. 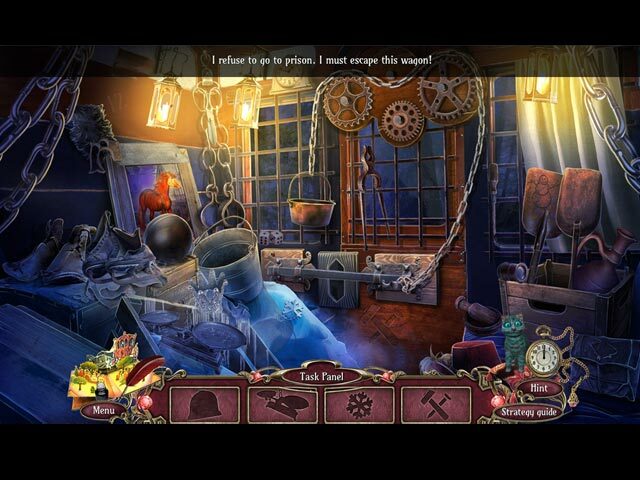 It more fits Grim Tales or a similar series and is a mis-step by the developers. Cinderella is part of some council of princesses running Fairyland while the princes who normally run the place are out in battle. Except Cinderella is confused as to exactly who she is and so is trying to restore her memories. This includes a visit to a therapist. None of this makes any real sense nor do you experience anything compelling enough to cause you to want to make the effort to piece any of it together so that it might make sense. I found no compelling reason to pay attention to the cut scenes or the storyline after a bit. Once you get past the story issues--and that's not easy to get past--you will experience a game filled with content in every scene. Lots of good eye candy here--the artwork is generally sharp and well-executed. Some of the cut scenes look visually strong (in spite of the story they are recounting). The music and voiceovers are generally good. Gameplay itself has some unusual puzzles. I enjoyed a driving game that seemed inspired by 80's arcade game Spy Hunter that seems original for the genre. A magnet game to maneuver a key through pipes in an aquarium is well-executed. An interesting game that required pulling strings to size and align page pieces was done nicely. The gameplay overall has a lot of polish and some new sights, although nothing is especially challenging. Unfortunately, that polish is mostly invested not in the highlights above, but the usual litany of object collection and finding things that fit in locks. Lots of locks. Elephant Games revels in locks that are opened by tokens and pieces littered across the world. As always no one can hold onto a key or a token making the game world a thief's paradise. This aspect of these games is getting ridiculous. Can we have a world where the people who inhabit it don't lose the items need to access every secure door and container? At the end of the day, what you have here is a polished game with a few interesting puzzles that is weighed down by a disastrously incoherent plot and far too many of the usual tropes of this genre. If the effort and attention paid to the artwork had been paid to the plot and the overall gameplay, this could have been a winner.